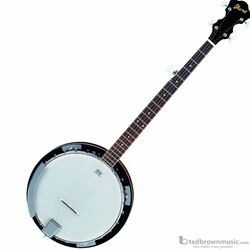 It's been three decades since Ibanez was in the banjo biz, but we're back with a bang... or is it a twang? Old-timers may recall Ibanez was quite enamored with banjo-building, having even collaborated on an artist signature model with the late great Earl Scruggs. But, things change, and hair bands happen. And now, we're back at it, and in the Ibanez tradition, the B50 delivers a sweet 5-string closed-back banjo at a price that won't break the bank.